rocketdoctor had the most liked content! Amazing that our worrygoing into the playoffs was goaltending. I guess that as this thread fell so far down that everyone is content with Smitty's performances? I just hope he isn't tired out with all the work we have given him. Go Flames Go Go Flames Go Go Flames Go! Oh Hath you could have been a hero Go Flames Go! 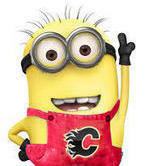 Lets have a great 3rd period boys Go Flames Go! Anyways lets build on the first and come out strong in the second. Go Flames Go! Avs had the better chances. Can't think of one grade A Cchance for us.